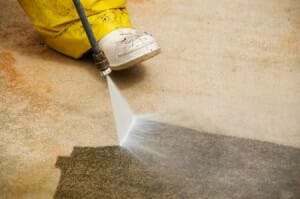 Using a pressure washer to clean an unusually dirty garage floor of oil stains, ground in dirt, and other debris can be highly effective and requires less work than other traditional methods. 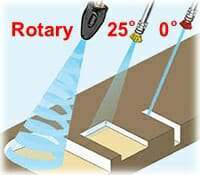 The key however is to choose the correct type of pressure washer to use on your garage floor in order to get good results. Choose the wrong one and you will be less than happy. So let’s discuss what type of pressure washer to use, tips for cleaning your garage floor with a pressure washer, and some important safety guidelines to consider. Before we start, we need to learn the difference between a pressure washer and a power washer. Many times these terms are used interchangeably by the novice without realizing they are two different types of machines. The main difference is that a pressure washer is a cold water unit while a power washer is a hot water unit. Power washers are much heavier due to the heating coil that is used to heat the water and they are much more expensive to rent. While hot water does work better at breaking down oils, pressure washers work great at cleaning concrete for most situations and are the better value when renting. Only if you have a seriously oily garage should you consider renting a power washer instead. Tip: Don’t hook a pressure washer up to a hot water line in your home. The seals and gaskets used for the pump are not designed for hot water temperatures and will deteriorate quickly if you do. 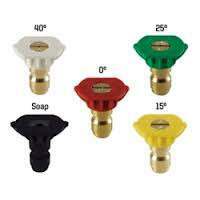 Select the yellow 15° spray nozzle. This works best for heavy cleaning in most areas. If the floor isn’t too dirty, you can try the green 25° nozzle as it will cover a larger area but uses less force. The key is to keep the tip of the wand 6” -12” from the surface while pressure washing the concrete. Always keep the wand moving and don’t linger in one spot too long or you can possibly etch the concrete. A deliberate and methodical pattern works well and will keep you from missing any areas. Should pressure washing be done before or after grinding? Both? Hello Scott. If you have oil based stains and grit in the concrete you will want to pressure wash first before you grind. Once you grind, a good shop vac with a floor attachment works well for picking up the remaining dust or you can pressure wash again afterwords. Just be sure to test areas where the stains were to make sure they absorb water. If not, it may require a second round of degreasing and pressure washing that area followed by grinding again. If your floor is fairly oil free, you can pressure wash afterwards instead. I couldn’t have advised people any better, Shea. Not only is this a great resource for someone looking to rent the right unit, but the cleaning tips are helpful, too. It’s not often you find info describing the difference between a pressure washer and a power washer, either. Thanks for helping to put great info out there for people to find!